Using its extensive expertise in peptide synthesis and vaccine development Pepscan has developed the Precision Epitope Mapping platform to profile all types of epitopes for big panels of biological samples (antibodies and antibody fragments, purified proteins and sera). Applying its thorough expertise in structured peptides, Pepscan generated various strategies in addressing linear, conformational and discontinuous epitopes via fully customized library designs and bio-informatical data analysis tools. The concept of mapping linear epitopes using libraries of overlapping synthetic peptides was for pioneered by Pepscan founders Geysen and Meloen. Since then this technology was widely applied by many companies and research groups for various projects. As the inventor of the technology Pepscan has long standing expertise in addressing linear epitopes by directly synthesizing libraries of linear peptides on a solid support covered with a proprietary hydrogel formulation, which allows working with biomolecules and can be easily regenerated for profiling big sample sets. To generate a library of linear mimics, the correct amino acid sequence of the immunogen (or target protein) is split in overlapping fragments in silico, which are then synthesized on a solid support. Once the linear array is synthesized, binding of a test antibody to such library is quantified and compared via an ELISA. When the epitope sequence is present in linear peptides, the antibody avidly binds this set of peptides (as schematically shown below). The target linear sequence is converted into a library of all overlapping linear peptides directly synthesized on a proprietary solid support called “mini-card”. Binding of antibodies is quantified using an automated ELISA-type read-out. Constructs containing the right amino acid sequence in the correct conformation best bind the antibody. However, the majority of biomolecules of therapeutic interest recognize conformational or discontinuous epitopes, which cannot be reliably (if at all) addressed by means of linear epitope mapping. 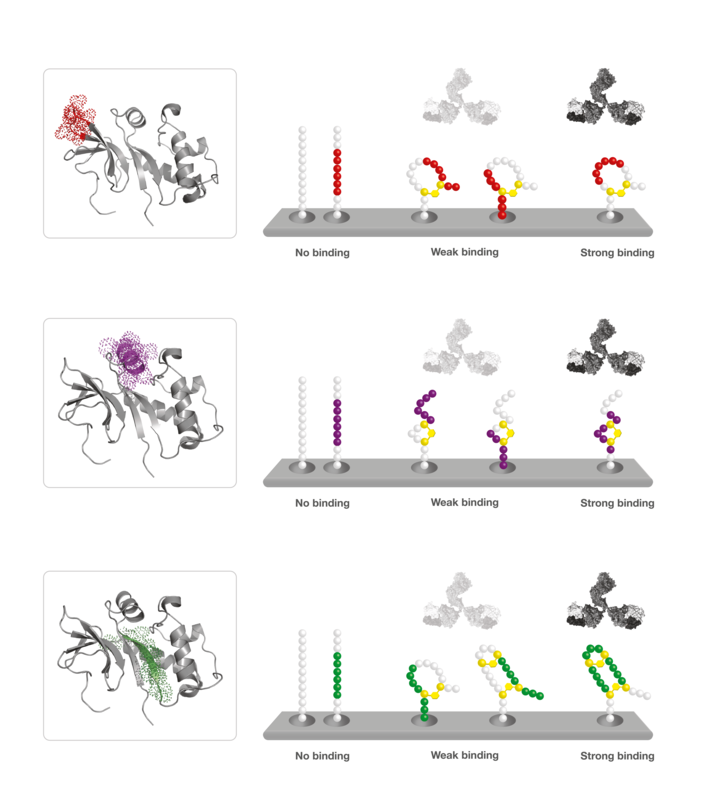 For many antibodies, the primary sequence of amino acids is not sufficient for binding and additional 3D structure features are needed. This is why Pepscan perfected its platform to enable systematic mapping of conformational and discontinuous epitopes. One example is creating simple secondary structure mimics by applying different CLIPS scaffolds allowing to thermodynamically favour a limited series of peptide conformations. In such a manner CLIPS peptide library can mimic secondary structure elements, such as loops, α-helixes and β-strands. A schematic representation of this approach is drawn in the figure below, where all three secondary structure elements present in the target’s 3D structure are mimicked using various CLIPS chemistry strategies. The target protein contains α-helixes, β-sheets separated by loops is converted into different conformational libraries using a CLIPS scaffold. Peptides are synthesized on a proprietary minicard and chemically converted into spatially defined CLIPS constructs (right). Binding of antibodies is quantified using an automated ELISA-type read-out. Constructs containing the right amino acid sequence in the correct conformation best bind the antibody. It is also possible to create a large combinatorial library of CLIPS based tertiary structure mimics. Using a combinatorial matrix design and different CLIPS scaffolds, the target protein is converted into an extensive library of conformationally constrained mimics that has sequences which are not adjacent in the primary sequence brought together on a CLIPS scaffold. This library of CLIPS-based tertiary structure mimics is then synthesized on a solid support, using high-throughput microarray synthesis technology. Subsequently, the binding of the antibody to each construct of the entire library is determined, using an automated ELISA-type read-out. This identifies those CLIPS-constructs that best mimic the interaction site of interest. A schematic representation of the approach is presented in the figure below. Designed constructs containing both parts of the interaction site in the correct orientation are bound with the highest affinity by the test antibody, which is detected and quantified. Constructs representing theincomplete epitope bind the antibody with much lower affinity, whereas constructs not containing (parts of) the epitope are not bound by the antibody at all. Bioinformatic statistics-based analysis of the combined binding data is used to define the sequence and conformation of epitopes in detail. CLIPS Precision Epitope Mapping also allows detecting of conformational, discontinuous, and complex epitopes involving dimeric or multimeric protein complexes. The target protein containing a discontinuous conformational epitope (left cartoon) is converted into a library of linear peptides as well as CLIPS constructs via a combinatorial matrix design. Peptides are synthesized on a proprietary minicard and chemically converted into spatially defined CLIPS constructs (right). Binding of antibodies is quantified using an automated ELISA-type read-out. Constructs representing both parts of the discontinuous epitope in the correct orientation best binds the antibody. The Precision Epitope Mapping is based on Pepscan’s proprietary platform for making microarrays containing large libraries of surface-immobilized linear, secondary and tertiary structure CLIPS-based epitope mimics. Using high-throughput parallel microarray synthesis technology, a full library of linear, conformational and discontinuous epitope mimics, is synthesized on a proprietary surface with a polymeric graft optimized for low non-specific binding and high peptide construct loading resulting in high sensitivity of the Precision Epitope Mapping technology. Via Pepscan’s patented CLIPS technology these peptides are structurally fixed into defined three-dimensional structures. This enables mimicking even the most complex binding sites. The CLIPS technology is now routinely used to create peptide libraries of single- or double- looped structures, as well as sheet- and helix-like folds. Using the CLIPS technology, peptides derived from native proteins are transformed into CLIPS constructs with a range of structures. From left to right: linear, single mP2 loops, stabilized beta sheet, alpha helix, and T3 double loop.